Nantucket is an island about 30mi by ferry south from Cape Cod, in the American state of Massachusetts. Get some historical perspective at Sankaty Head Lighthouse and Brant Point Lighthouse. Get a sense of the local culture at Whaling Museum and Milestone Bog. There's lots more to do: tour the pleasant surroundings at Cisco Beach, enjoy the sand and surf at Nobadeer, pause for some serene contemplation at St Paul's Episcopal Church, and enjoy the sea views from Great Point Light. To see reviews, ratings, other places to visit, and more tourist information, read our Nantucket trip itinerary planning tool . Milan, Italy to Nantucket is an approximately 17-hour flight. You'll gain 6 hours traveling from Milan to Nantucket due to the time zone difference. Expect little chillier weather when traveling from Milan in September: highs in Nantucket hover around 25°C, while lows dip to 17°C. Finish up your sightseeing early on the 5th (Thu) so you can travel to Hilton Head. Take a break from the city and head to Parasailing & Paragliding and Speed Boats Tours. You'll explore the less-touristy side of things at Fishing Charters & Tours and Waterskiing & Jetskiing. 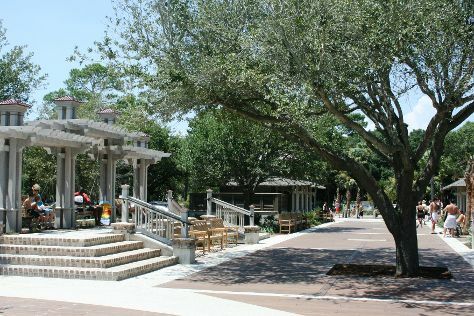 There's still lots to do: stroll through Hilton Head Island Bike Trails, kick back and relax at Burkes Beach, and take a tour by water with Boat Tours & Water Sports. You can plan Hilton Head trip in no time by asking Inspirock to help create your itinerary. Traveling by flight from Nantucket to Hilton Head takes 8.5 hours. Alternatively, you can do a combination of flight and bus; or do a combination of ferry, bus, and train. Plan for somewhat warmer temperatures traveling from Nantucket in September, with highs in Hilton Head at 34°C and lows at 25°C. Finish your sightseeing early on the 8th (Sun) so you can travel to Marathon. 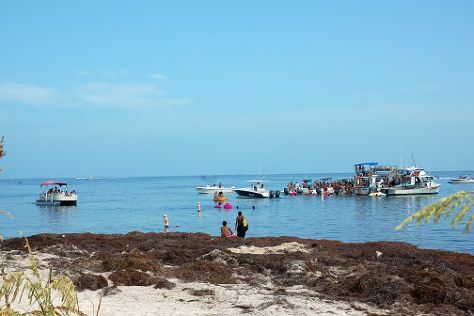 Kick off your visit on the 9th (Mon): enjoy the sand and surf at Sombrero Beach, then identify plant and animal life at The Turtle Hospital, and then immerse yourself in nature at Bahia Honda State Park. Keep things going the next day: identify plant and animal life at Dolphin Research Center and then take a tour by water with Boat Tours & Water Sports. To see traveler tips, reviews, other places to visit, and other tourist information, you can read our Marathon trip itinerary planner . Traveling by combination of flight and bus from Hilton Head to Marathon takes 8 hours. Alternatively, you can do a combination of bus, flight, and shuttle; or drive. Traveling from Hilton Head in September, expect Marathon to be a bit warmer, temps between 38°C and 30°C. Finish up your sightseeing early on the 10th (Tue) so you can travel to Branson. Kick off your visit on the 11th (Wed): identify plant and animal life at Shepherd of the Hills Fish Hatchery, contemplate the waterfront views at Table Rock Lake, and then examine the collection at Titanic Museum. Get ready for a full day of sightseeing on the next day: tour the pleasant surroundings at Talking Rocks Cavern, then look for all kinds of wild species at Dogwood Canyon Nature Park, and then contemplate in the serene atmosphere at Thorncrown Chapel. To find reviews, traveler tips, photos, and more tourist information, refer to the Branson driving holiday tool . You can do a combination of bus and flight from Marathon to Branson in 7.5 hours. Other options are to do a combination of shuttle and flight; or drive. The time zone difference when traveling from Marathon to Branson is minus 1 hour. Traveling from Marathon in September, things will get little chillier in Branson: highs are around 32°C and lows about 18°C. Finish your sightseeing early on the 12th (Thu) so you can travel to Custer. Eschew the tourist crowds and head to Wind Cave National Park and Black Hills National Forest. Visiting Presidential Trail and Mammoth Site of Hot Springs will get you outdoors. Change things up with these side-trips from Custer: Spearfish Falls (in Savoy), Windcross Conservancy (in Buffalo Gap) and Mount Moriah Cemetery (in Deadwood). And it doesn't end there: take in the dramatic natural features at Needles Eye Tunnel, explore and take pictures at Iron Mountain Road, cruise along Wildlife Loop Road, and explore the wealth of natural beauty at Mount Rushmore National Memorial. For photos, ratings, maps, and tourist information, refer to the Custer day trip app . Traveling by combination of flight and taxi from Branson to Custer takes 6.5 hours. Alternatively, you can do a combination of car, flight, and taxi; or drive. The time zone difference moving from Central Standard Time (CST) to Mountain Standard Time (MST) is minus 1 hour. Expect slightly colder temperatures when traveling from Branson in September; daily highs in Custer reach 25°C and lows reach 8°C. Finish your sightseeing early on the 16th (Mon) so you can travel to Yellowstone National Park. Get in touch with nature at Artist Point and Grand Prismatic Spring. Spend the 19th (Thu) exploring nature at Yellowstone National Park. 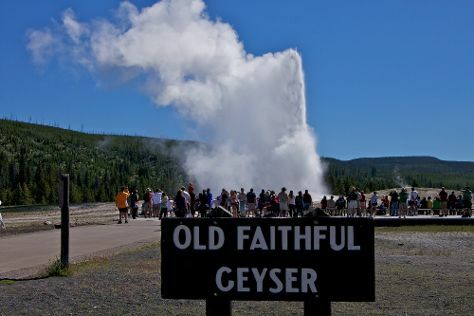 The adventure continues: take in the natural beauty of Old Faithful, take in breathtaking views at Grand Canyon of the Yellowstone, take in the dramatic natural features at Lower Geyser Basin, and look for all kinds of wild species at Gibbon Falls. To see more things to do, other places to visit, photos, and other tourist information, use the Yellowstone National Park day trip site . Do a combination of taxi, flight, and car from Custer to Yellowstone National Park in 7 hours. Alternatively, you can drive; or do a combination of car and flight. Expect a bit cooler temperatures when traveling from Custer in September; daily highs in Yellowstone National Park reach 18°C and lows reach 0°C. Finish your sightseeing early on the 20th (Fri) so you can travel to Kailua-Kona. You'll get in some beach time at Manini'owali Beach (Kua Bay) and Hapuna Beach State Recreation Area. Get some cultural insight at Pu'uhonua O Honaunau National Historical Park and Kealakekua Bay. Step out of Kailua-Kona with an excursion to Rainbow Falls in Hilo--about 1h 55 min away. And it doesn't end there: see what you can catch with a fishing tour, see majestic marine mammals with a dolphin and whale watching tour, take a memorable tour with Tours, and take in the awesome beauty at Mauna Kea. To find other places to visit, maps, more things to do, and tourist information, read our Kailua-Kona trip builder website . Do a combination of car and flight from Yellowstone National Park to Kailua-Kona in 13 hours. Alternatively, you can do a combination of car, shuttle, and flight; or do a combination of bus, shuttle, and flight. Due to the time zone difference, you'll gain 3 hours traveling from Yellowstone National Park to Kailua-Kona. Prepare for warmer weather when traveling from Yellowstone National Park in September: high temperatures in Kailua-Kona hover around 36°C and lows are around 28°C. Finish your sightseeing early on the 24th (Tue) so you can travel to Lahaina. We've included these beaches for you: Kahekili Beach Park and Napili Beach. Step off the beaten path and head to Wailea Beach and Lahaina Front Street. Go for a jaunt from Lahaina to Kihei to see Scuba & Snorkeling about 40 minutes away. And it doesn't end there: whizz through the canopy at some of the top local zipline courses and adventure parks, make a trip to Lahaina Banyan Court, and get up close to creatures of the deep with a dolphin and whale watching tour. For reviews, other places to visit, where to stay, and tourist information, use the Lahaina holiday tool . You can fly from Kailua-Kona to Lahaina in 4 hours. Alternatively, you can do a combination of flight and bus; or do a combination of bus and flight. Expect a daytime high around 35°C in September, and nighttime lows around 27°C. Finish your sightseeing early on the 27th (Fri) to allow enough time to travel to Honolulu. Visit USS Arizona Memorial and Battleship Missouri Memorial for their historical value. National Memorial Cemetery of the Pacific and USS Bowfin Submarine Museum & Park are good opportunities to explore the local culture. Get out of town with these interesting Honolulu side-trips: Kailua (Kailua Beach Park & Lanikai Beach), Byodo-In Temple (in Kaneohe) and Swim with Dolphins (in Waianae). There's more to do: kick back and relax at Waikiki Beach and steep yourself in history at Iolani Palace. To see other places to visit, more things to do, photos, and other tourist information, use the Honolulu route builder . Getting from Lahaina to Honolulu by flight takes about 3.5 hours. Other options: do a combination of ferry and flight; or do a combination of bus and flight. In September, daytime highs in Honolulu are 36°C, while nighttime lows are 28°C. Finish your sightseeing early on the 1st (Tue) so you can travel to Yosemite National Park. Step off the beaten path and head to Bodie State Historic Park and Mono Lake County Park. 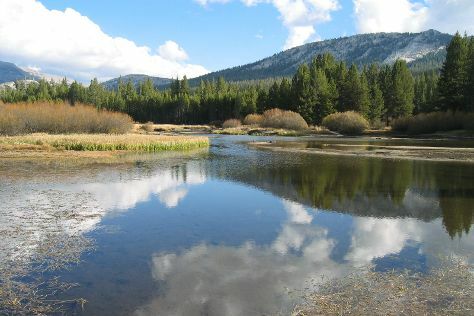 Get in touch with nature at Tuolumne Meadows and Mariposa Grove of Giant Sequoias. There's much more to do: take some stellar pictures from Tunnel View, take in the dramatic natural features at Glacier Point, don't miss a visit to Olmsted Point, and trek along Panorama Trail. To see more things to do, photos, traveler tips, and tourist information, you can read our Yosemite National Park online sightseeing planner . You can do a combination of flight and car from Honolulu to Yosemite National Park in 12 hours. Another option is to do a combination of flight and bus. The time zone difference when traveling from Honolulu to Yosemite National Park is 2 hours. Prepare for cooler weather when traveling from Honolulu in October: high temperatures in Yosemite National Park hover around 22°C and lows are around -2°C. Cap off your sightseeing on the 5th (Sat) early enough to travel to Santa Fe. On the 6th (Sun), admire the masterpieces at Georgia O'Keeffe Museum, contemplate the long history of Santa Fe Plaza, then take in the spiritual surroundings of Loretto Chapel, then appreciate the extensive heritage of Canyon Road, and finally pause for some serene contemplation at The Cathedral Basilica of St. Francis of Assisi. Keep things going the next day: let the river carry you with a rafting and tubing tour, then take in the spiritual surroundings of El Santuario de Chimayo, and then take in the architecture and atmosphere at Santo Nino Chapel. To find ratings, reviews, where to stay, and other tourist information, read Santa Fe driving holiday app . Do a combination of car and flight from Yosemite National Park to Santa Fe in 8 hours. Alternatively, you can do a combination of car, flight, and shuttle; or drive. The time zone changes from Pacific Standard Time (PST) to Mountain Standard Time (MST), which is usually a 1 hour difference. Traveling from Yosemite National Park in October, expect a bit warmer with lows of 5°C in Santa Fe. Finish your sightseeing early on the 7th (Mon) so you can travel back home.